The Inside Job is a documentary like few of its contemporaries: mainstream and accessible enough to win an Academy Award, yet sharp, piercing and well-researched enough to actually convince even the most sceptical among the viewers. This is a film narrated by an A-list hollywood star, Matt Damon, that dares to shred the current global economic system to pieces, along with the financial organisations that comprise it. A film that presents — in (perhaps over)simplified, digestible fashion — all those aspects of the financial crisis of 2008 that torment and dehumanise billions of people globally; that exposes the incomprehensible greed of those in the U.S. financial sector, the history behind financial deregulation from the 1980s onwards, the excesses, the abuse and the corruption that remains to this date unchallenged by the political powers, in the States and elsewhere, despite the damage the the system (not the crisis itself) has caused to both U.S. and European countries. 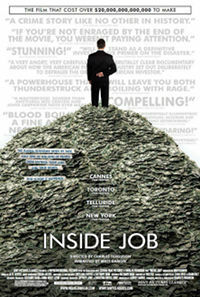 What really stuck in my mind after watching Inside Job, is how — throughout the film — the importance of credit rating organisations is highlighted and showcased in several occasions; organisations like Finch, Moody’s and Standard and Poor’s that provide ratings for anything ranging from corporations, bonds and sovereign states. Corporations that gave AAA ratings to CDOs based on subprime mortgages, allowing them to be bought by large institutional investors with strict requirements with regards to their portfolio contents. Corporations that had a determining role in the ‘creation’ of one of the greatest global financial crises of the past century and that continue to do so, through collusion with large financial organisations and as seen through their effects in the recent — partly unfounded — rating downgrades of various european states based on their national debt. Surprisingly, those organisations were not affected by the crisis, despite their role and their position in the market. When asked, they all stated that their ratings only reflect their ‘opinion’, somehow deflecting the real issue — their de facto institutional part in a system of ‘free market’ that is largely guided by them. Despite their monumental failing, their antisocial, anti-investor, borderline illegal masking of the true value of subprime based CDOs in the mid 2000s and up until the 2008 crisis, those organisations continue to provide ratings as if they have a perfect reputation. I cannot imaging any other profession or industry when a person or corporation has consistently failed so bad at their core function and have remained in business, let alone maintained a dominant position that largely determines the actions of the largest institutional investors and with them the market. For someone without intricate knowledge of economics and the way the financial sector in the U.S. works, Inside Job is worth watching even if it were only for the interviews and the simplified explanations of the crisis — which occasionally border on oversimplification. It serves as an eye opener that showcases how little has changed since the 2008 crisis, how consistent the actions of recent U.S. presidents (including Obama’s) have been with regards to turning a blind eye (or even supporting) Wall Street’s reckless course for profit, how the system is still as fragile, dangerous and completely inadequate, run by the same people and organisations that caused the 2008 crisis and (un)regulated in the same way. If anything Inside Job is approachable and basically sound, which is more than one can say for most other works out there that often border on sentimentalist, populist drivel similar to Moore’s works or high-brow academic works that alienate the intellectually-challenged. I just saw the documentary and came back to re-read your review. What strikes me most is the way the interviewer corners the chief economists and makes them look silly and speechless. I consider it the culprit of journalism. Taking silly answers for real ones, is what made me avoid watching news and political shows in Greek television. Journalists in Greece do that all the time. I’ve read on blog that economists like Hubbard and others appeared in the documentary because they didn’t thought that they’ll have to answer uncomfortable questions and that their answers will not be taking as a ‘universal truth’ by the director/journalist. They are not used to this kind of treatment. Another important aspect that I never thought, is the ‘discussion framing’ which is driven by economists at famous universities.